Samsung had unveiled the Galaxy A5 (2017) earlier this year running Android 6.0.1 (Marshmallow), but it looks like the phone will soon get the Android 7.0 update. 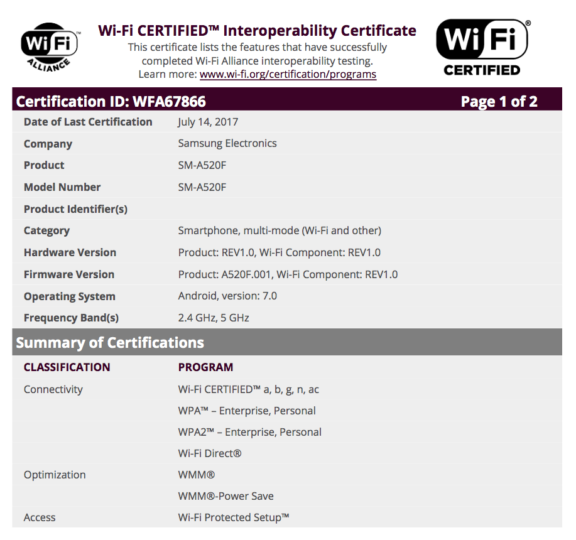 The company received Wi-Fi certification for the Galaxy A5 (2017) running Android 7.0 earlier today, which means that the South Korean smartphone giant is close to releasing the Android 7.0 (Nougat) update to the smartphone. The Galaxy A5 (2017) features a 5.2-inch 1080p Super AMOLED display with support for Always On Display. It comes with a 16-megapixel primary camera and a 16-megapixel secondary camera, both with f/1.9 aperture and 1080p video recording. The phone comes equipped with an octa-core Exynos 7880 processor, 3GB RAM, 32GB internal storage, a microSD card slot, and a 3,000mAh battery. Samsung has already released the Android 7.0 update for various Galaxy S and Galaxy Note series of smartphones, and now it’s time for the Galaxy A series smartphones to get the Nougat update. I bought a A5 (2017) on January but still haven’t received the Android 7!! It is now 30th of September. When do you send it . Hay algo que no entiendo porque Samsung actualiza primero el A3 y el A5 si el A7 2017 es más caro tendría que ser primero el A7 de ahí los más bajos. Que desordenado es Samsung. When will Galaxy A5 2017 get Android 7.0 update?It was two days behind schedule. The A series will be with the Samsung Experience UI. The Galaxy A3 2017 in Russia got it. Any news? Any specific date, etc. like that? It’s 31st of July. Temmuz means July. Nougat will come with samsung experience UI or the A5 will stay with grace UX? It will probably be the Experience UI. Grace UX went to the line 2016. It’s very shame full dear ShameSung. Strange that a5 2017 not have android 7.0 from launch. She wants to always start working with the new version of Android when it’s about to launch a new generation of the Galaxy S line, so those that are released before it or even a few after it go out at a loss. That is irresponsibility of Samsung, it sure is! Why do A5 2016 already updated to nougat while A5 2017 still on Marshmallow? One of the strategic fault of Samsung Mobile. Dadash az tarze harf zadanet malome irani hasti! I’m waiting to see a notification for the Nougat update. Hopefully the UI will be the same as the Galaxy S8 and S8+.